Holy Boss (by Street Boss out of Holy Grace, by Holy Bull), a brilliant Grade 2-winning sprinter by his up-and-coming young sire, stands at Anchor & Hope Farm in Maryland. Holy Boss was a precocious 2-year-old that matured into a brilliant and durable sprinter, capturing four stakes and placing in a pair of Grade 1s through his 5-year-old season. A son of the multiple Grade 1 winner and three-time record-setting sprinter Street Boss, who has sired five Grade/Group 1 winners in his first four crops, Holy Boss is a half-brother to classic winner Holy Helena. Holy Boss and Holy Helena are out of the Holy Bull mare Holy Grace, who comes from a deep black-type family tracing back to Holy Boss’s fourth dam, the Blue Hen mare Missy Baba. Successful sires descending tail-female from Missy Baba include A.P. Indy, Summer Squall, Lemon Drop Kid, Honor Grades, Raja Baba and Sauce Boat. As Street Boss’s first crop was foaled in 2010, he has just one son of his own at stud with runners of racing age so far, that being the Grade 1 winner Capo Bastone, who has made an excellent start with three juvenile debut winners from his first three foals to race thus far in 2018. Street Boss, in turn, is a son of the Dubai World Cup-G1 winner and top-class stallion Street Cry[IRE], who was also responsible for Eclipse Champion 2-year-old and Kentucky Derby-G1 winner Street Sense (now a leading young sire), the historically consistent champion mares Zenyatta and Winx, Breeders’ Cup Juvenile-G1 winner New Year’s Day, etc. Street Boss’s best runner so far is the Kentucky Oaks-G1 winner Cathryn Sophia, out of a daughter of Mineshaft, and she is one of three stakes winners for Street Boss out of mares by sons of A.P. Indy from just 35 foals of racing age bred that way. Street Boss has also sired Grade 3 winner Hence out of a daughter of A.P. Indy himself, while two other sons of Street Cry[IRE] have sired stakes winners out of mares by other sons of A.P. Indy. Given how loaded the Mid-Atlantic mare population is with mares by sons of A.P. Indy — including Rock Slide (a full-brother to Mineshaft), Malibu Moon (like Mineshaft, out of a Mr. Prospector mare), Friesan Fire, Jump Start and Scipion — this bodes very well for Holy Boss and is a cross that should prove quite productive (and one that will also result in line-breeding to Missy Baba, mentioned above, who is the fourth dam of both Holy Boss and A.P. Indy). One of the other Street Boss stakes winners out of a mare by a son of A.P. Indy is from a daughter of Pulpit, he in turn the sire of current leading sire Tapit, as well as of current and former Mid-Atlantic stallions Corinthian, El Padrino, Oratory and Super Ninety Nine; daughters of those sires ought to be tried with Holy Boss, too. Other A.P. Indy grandsons in the region whose daughters would make sense with Holy Boss include Baltimore Bob, Buffum, Freedom Child and Silver Train. A.P. Indy’s sire Seattle Slew represents a branch of the Bold Ruler sire-line, while another branch descends to Fit to Fight, the broodmare sire of Street Boss’s Grade 1 winner Capo Bastone, and pensioned Pennsylvania stallion Formal Dinner is from another branch of Bold Ruler via Raja Baba. Numerically speaking, Street Boss has had the most success at stud with mares by sons and grandsons of Mr. Prospector, as he counts three stakes winners bred on each of those patterns. Those six stakes winners are from daughters of six different descendants of Mr. Prospector, including a stakes winner from just one runner out of a mare by former Maryland stalwart Not For Love — making that one’s daughters an exciting pairing for Holy Boss. Current Maryland stallion Petionville (by Seeking the Gold) is already the broodmare sire of Grade 1 winner McKinzie by another son of Street Cry[IRE], and Street Boss himself has a stakes winner out of a mare by another son of Seeking the Gold, so daughters of Petionville make plenty of sense with Holy Boss, too. There is a Street Boss stakes winner out of a mare by Mr. Prospector’s grandson Lemon Drop Kid, who also shares his fourth dam, Missy Baba, with Holy Boss. Lemon Drop Kid is the sire of recent West Virginia stallion Charitable Man. Another son of Street Cry[IRE] is responsible for a Grade 1 winner out of a mare by the Mr. Prospector grandson Coronado’s Quest, making mares by Distorted Humor (like Coronado’s Quest a son of Forty Niner) and his sons also intriguing here. Other stakes winners by sons of Street Cry[IRE] from Mr. Prospector-line mares include those out of daughters of Unbridled (whose Mid-Atlantic representatives include his son Unbridled Jet and grandsons Fiber Sonde, Rockport Harbor and Domestic Dispute) and Grand Slam (sire of current West Virginia leading sire Limehouse and a son of Gone West, who is also the sire of Elusive Quality, he in turn the sire of current leading Maryland stallion Great Notion). Other Mr. Prospector-line stallions with representation in the local mare population that would make sense to try with Holy Boss include Allen’s Prospect, Black Tie Affair[IRE], Dublin, E Dubai, Hey Chub, Mojave Moon, Two Punch and Windsor Castle. Street Boss has a high percentage of stakes winners out of mares by sons and grandsons of Storm Cat, including two out of daughters of Stormy Atlantic (another son of Street Cry[IRE] has also sired a stakes winner from a Stormy Atlantic mare; Stormy Atlantic is the sire of Maryland stallion Gators N Bears), one from a daughter of Hennessy and another from a daughter of that one’s son Henny Hughes (making mares by former Pennsylvania sire Wiseman’s Ferry, by Hennessy, especially intriguing for Holy Boss), and one out of a mare by Forest Wildcat, who is also the broodmare sire of a Grade 1 winner by another son of Street Cry[IRE]. Former Pennsylvania sire Cat Thief is the broodmare sire of a Grade 1 winner by a son of Street Cry[IRE]; a daughter of regional stallion Sir Cat has thrown a Grade 3 winner by a son of Street Cry[IRE]; and there are stakes winners by sons of Street Cry[IRE] from daughters of Forestry (sire of former Maryland stallion Etched), Giant’s Causeway (whose son Shamardal is also the broodmare sire of a Grade 3 winner by a son of Street Cry[IRE], making former Mid-Atlantic stallion Fairbanks’ daughters a good bet with Holy Boss), and Stormin Fever. Daughters of the former Maryland sire Lion Hearted (by Storm Cat) and current Pennsylvania resident Talent Search (by Storm Cat’s son Catienus) are worth trying with Holy Boss, as well. Street Boss is the sire of Grade 1 winner Danza out of a daughter of French Deputy, who is by Deputy Minister. The latter is himself the broodmare sire of a Grade 3 winner and a stakes winner by another son of Street Cry[IRE], while yet another son of Street Cry[IRE] has produced a stakes winner out of a mare by Silver Deputy. Deputy Minister’s grandson Ghostzapper is the broodmare sire of a Grade 3 winner by a son of Street Cry[IRE] (Ghostzapper also happens to be the sire of Holy Boss’s high-class half-sister Holy Helena). Local members of the Deputy Minister sire-line include Talk Is Money (in Pennsylvania), Yarrow Brae and Ghostly Minister (from West Virginia) and Defrere (in New Jersey), all four by Deputy Minister himself, as well as the Deputy Minister grandson Medallist (by Touch Gold) in Pennsylvania. 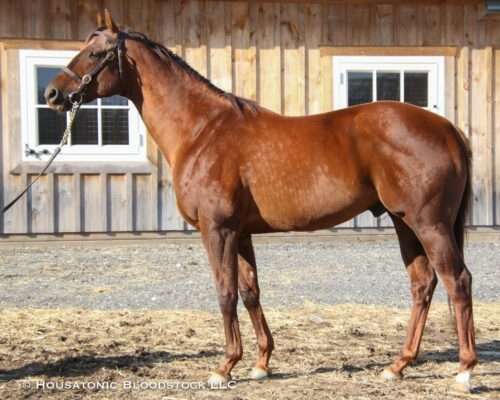 The Pennsylvania stallion Partner’s Hero, by Danzig, is the broodmare sire of a stakes winner by a Street Cry[IRE] son; his daughters should work nicely with Holy Boss, as should those of fellow Pennsylvania resident Weigelia, whose sire, Safely’s Mark, is closely related to Partner’s Hero. Another Danzig son, Danzig Connection, is the broodmare sire of a pair of Graded winners by a son of Street Cry[IRE], and there are six more sons of Danzig who are each the broodmare sire of a stakes winner by a total of three sons of Street Cry[IRE]. Mares by the local Danzig stallions Outflanker and Rimrod are absolutely worth trying with Holy Boss because of this, and there are still daughters of longtime leading Maryland sire Polish Numbers (by Danzig) around who should work well with Holy Boss, too. Furthermore, since Street Boss is already the sire of four stakes winners (three of them Group winners) out of mares by three different Danzig grandsons, the daughters of the numerous sons of War Front (by Danzig) who now stand in the region, namely Editorial, Mosler, Peace and Justice, and Royal Artillery, will also be worth trying with Holy Boss eventually. A further Northern Dancer-line stallion whose daughters have had stakes success with Street Boss and other sons of Street Cry[IRE] is Dixie Union (whose sire, Dixieland Band, is also the broodmare sire of Street Cry[IRE]’s Eclipse Champion Street Sense), meaning daughters of former Maryland stallion Citidancer (by Dixieland Band), plus his regional sire sons Cherokee’s Boy, Disco Rico and Park Avenue Ball, ought to be successful with Holy Boss. Street Boss has sired Grade 1 winner Decked Out from a daughter of You and I, he a son of the Hail to Reason-line horse Kris S. Kris S.’s best sire son is Arch, whose own sire sons include Archarcharch and Blame; daughters of all three should fit Holy Boss well, as should those of Kris S.’s son Prized, a one-time West Virginia resident. Hail to Reason can also be accessed via his son Halo (whose own son Parfaitement is already the broodmare sire of a stakes winner by a son of Street Cry[IRE], and whose other North American descendants include More Than Ready and his sons), and his grandson Dynaformer, whose Maryland-based son Nicanor’s daughters would be worth trying with Holy Boss. There is a Street Boss stakes winner out of a Wild Again mare, making daughters of that one’s regional son Offlee Wild a good bet for Holy Boss. Street Boss is the sire of a stakes winner out of a mare by Meadowlake (who is also the sire of the second dam of another Street Boss stakes winner), and he has two sons at stud in West Virginia whose daughters could be tried with Holy Boss, namely Luftikus and Meadow Monster. A son of Street Cry[IRE] has produced a multiple Grade 1 winner out of a mare by Mt. Livermore, whose son Orientate finished his career in Maryland and is a noted broodmare sire; Orientate’s daughters should be a great fit for Holy Boss. Mt. Livermore was a son of Blushing Groom[FR], whose other regional representatives include Bop (by Rahy) and During (by Cherokee Run); mares by those two West Virginia stallions should also pair nicely with Holy Boss. Finally, there is a Grade 3 winner by a son of Street Cry[IRE] out of a daughter of Albert the Great, he a son of Maryland-based Go For Gin (by Cormorant); daughters of both can be tried with Holy Boss, as can daughters of Go For Gin’s half-brother Pleasant Tap (by Pleasant Colony, like Cormorant a son of His Majesty).